What are the things that a person who called by God to do God’s work must keep in mind. Below are the things that a person who called by God to do God’s work must keep in mind. 1. Our God is very strong and powerful. No Satan is more powerful or stronger than our God. 2. People who do God’s works are very powerful servants. No witch or magician is more powerful than the person who do God’s work. Instead he has the authority and power to destroy all kinds of Divination, Evil Omens, Witchcraft or any such Demonic Powers. 3. Person who do God’s work has the authority to trample and overcome all the powers of the enemy. Jesus has given this authority to him. Enemies can’t remove or bind this authority. 4. 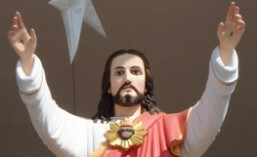 Divination, Evil Omens, Witchcraft or any such Demonic Powers can not do any harm to a person or family who believe in Jesus, proclaim and adore him. 5. Jesus and the Holy Spirit is always with a believer of Jesus as a Protector and Lord. 6. If you are a person who do God’s work, then nothing will happen in your life without the knowledge of God. 7. A person who do God’s work should resist and defeat all kind of thoughts and fear of Satan. 8. While doing God’s work Jesus or Apostles were never affected with demonic powers. 9. Remember that when Jesus sent Apostles for God’s work he never discussed anything about reactions or attack through demonic powers in their work. 3 He said to them, “Take nothing for your journey, no staff, nor bag, nor bread, nor money—not even an extra tunic. 4 Whatever house you enter, stay there, and leave from there. Believe the above Bible verses, trust in Jesus and continue God’s work without any fear. Resist and defeat satan in the name of Jesus. Spread the word of God. When doing God’s work and prayer for people affected with Divination, Evil Omens, Witchcraft or any such Demonic Powers, should be well prepared and pure in heart. There should be a guidance from spiritual leader and also should have respect and co-operation with church and religious leaders. 12 so that when the handkerchiefs or aprons that had touched his skin were brought to the sick, their diseases left them, and the evil spirits came out of them. 16 Then the man with the evil spirit leaped on them, mastered them all, and so overpowered them that they fled out of the house naked and wounded.